TA&A, an ISO9001 and ISO14001 registered company, is a leading manufacturer in China for Critical Environment and ESD control solutions. Our extensive product line includes ESD control/ cleanroom garments, footwear, cleanroom wipers, sticky mats, gloves, ionizers and work-station monitors, has earned itself the rights to distribute Kimberly Clark’s cleanroom gloves and Kuraray’s clean wipes.. CANMAX is TA&A’s brand, which is well-known in the domestic and oversea market. Made with the cleanest materials, CANMAX wipers are finished in the strict environment to achieve consistent physical properties, with the appropriate amount of absorbency, weight, and feel tailored to customer requirements. The wipers are then cut with patented technologies to seal the edges, removing a key source of fibres and particles. The wipers are packed in a class 10 cleanroom after being laundered with 18 megohm DI water, ensuring low particle counts and ionic contents. TA&A’s world-class testing center, equipped with fully imported contamination analysis systems from the U.S.A., the E.U. and Japan, ensure the quality is consistent. TA5003 roll clean wipers are constructed of 100% micro-denier continuous-filament, of a double knit construction. The wipe edges are sealed with unique ultrasonic-cutting technology, resulting in very low fiber and particle release for the most critical cleanroom applications. TA5006 roll clean wipers are constructed of 100% micro-denier continuous-filament, of a double knit construction. 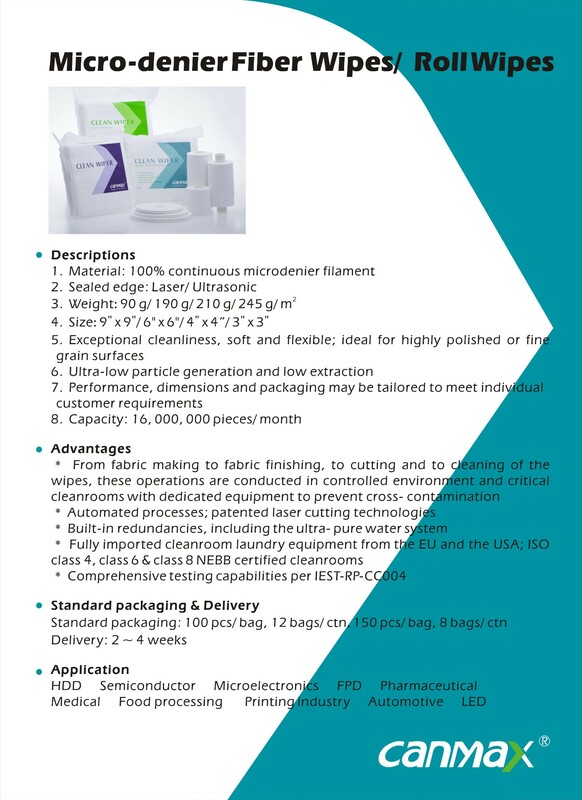 The wipe edges are sealed with unique ultrasonic-cutting technology, resulting in very low fiber and particle release for the most critical cleanroom applications. TA5007roll clean wipers are constructed of 100% micro-denier continuous-filament, of a double knit construction. The wipe edges are sealed with unique ultrasonic-cutting technology, resulting in very low fiber and particle release for the most critical cleanroom applications. TA5008 roll clean wipers are constructed of 100% micro-denier continuous-filament, of a double knit construction. The wipe edges are sealed with unique ultrasonic-cutting technology, resulting in very low fiber and particle release for the most critical cleanroom applications. TA8003 micro-denier fibre clean wipers are contstructed from 100% continuous microfiber. The wipe edges are sealed with patent laser-cutting technology, resulting in very low fiber and particle release for the most critical cleanroom applications. TA8006 micro-denier fibre clean wipers are contstructed from 100% continuous microfiber. The wipers edges are sealed with patent laser-cutting technology, resulting in very low fiber and particle release for the most critical cleanroom applications. TA8007 micro-denier fibre clean wipers are contstructed from 100% continuous microfiber. The wipers edges are sealed with patent laser-cutting technology, resulting in very low fiber and particle release for the most critical cleanroom applications. TA8009 is constructed from 100% micro-denier continuous-filament ,To prevent the release of fibres and particles, four edges of the wipers are sealed by laser or ultrasonic technology. TA900 polyester cleanroom wipers are constructed of 100% continuous-filament polyester in a doube-knit. To prevent the release of fibers and particles, four edges of the wipers are sealed by laser with our patented technology . cleanroom wipers are constructed of 100% continuous filament and double-knit polyester. To prevent the release of fibers and particles, four edges of the wipers are sealed by laser with our patented technology . 4、Exceptional abrasion resistance, ideal for LCD side wipping. TA9008 Polyester cleanroom wipers are constructed of 100% continuous filament and double-knit polyester. To prevent the release of fibers and particles, four edges of the wipers are sealed by laser with our patented technology . TA9009 Polyester cleanroom wipers are constructed of 100% continuous filament and double-knit polyester. To prevent the release of fibers and particles, four edges of the wipers are sealed by laser with our patented technology . TA9020 Polyester cleanroom wipers are constructed of 100% continuous filament and double-knit polyester. To prevent the release of fibers and particles, four edges of the wipers are sealed by laser with our patented technology . 4、Soft and exquisite, similar to micro-denier fiber.